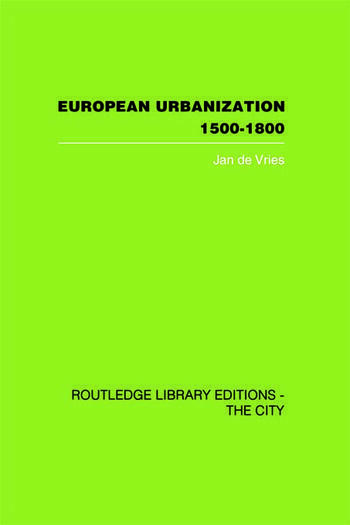 In European Urbanization Jan de Vries provides a comprehensive data base for understanding the nature of the changes that took place in European cities from 1500 to 1800. The book is based on an immense systematic survey of the population history of 379 European cities with 10,000 or more inhabitants analysed at fifty-year intervals. Using a wide range of economic, demographic and geographic models, Professor de Vries illustrates the patterns of urban growth, draws conclusions about the significance of migratory behaviour and shows the effects of urbanization on the history of Europe as a whole. Presenting these broad measures in urbanization the book makes the case that the cities of Europe gradually came to form a single urban system. The properties of this system are analysed with the use of several different geographical concepts: rank-size distribution, transition matrices and potential surfaces, among others. This examination of the fortunes of cities of different sizes and regions and the economic and political factors that affected their development is fundamentally important for understanding modern Europe and contemporary problems of urban development. Jan de Vries mines these rich, complex data to give us a balanced view of the dynamics of change in urban, pre-industrial society. This book was first published in 1984.